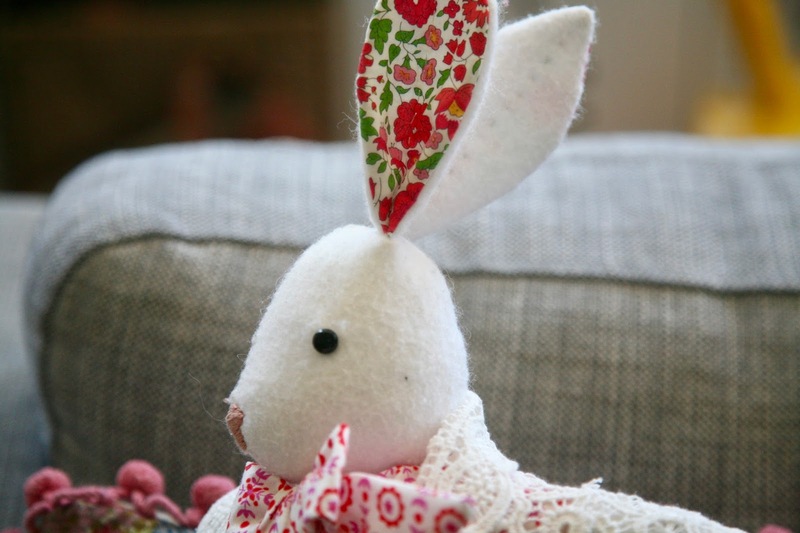 Inder Loves Folk Art: Luna Lapin: A Bunny for my Maggie Bunny. 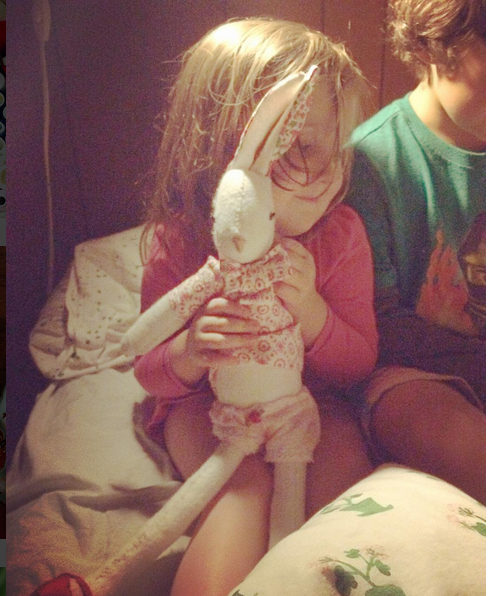 Luna Lapin: A Bunny for my Maggie Bunny. 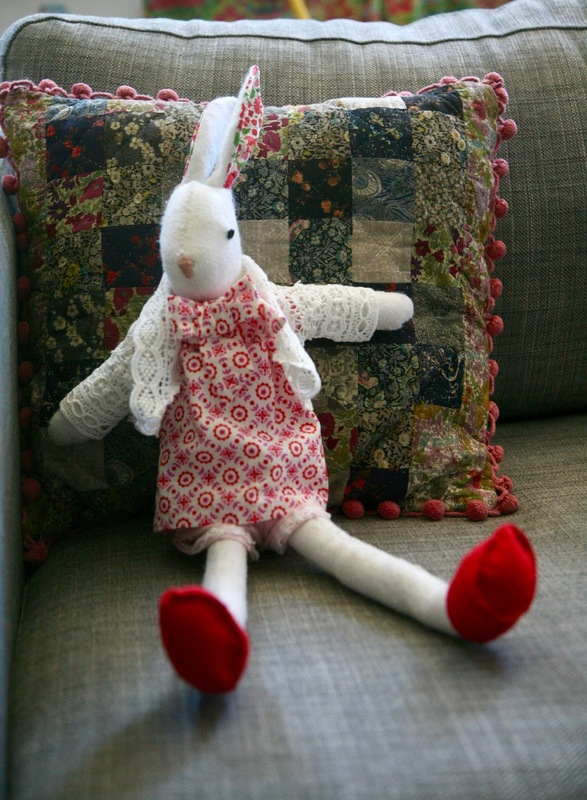 Meet Ms. Luna Lapin, a "quiet and kind rabbit with impeccable taste." Maggie and I discovered her through this lovely book, which I grabbed on impulse when I was browsing the local bookstore on my lunch break. 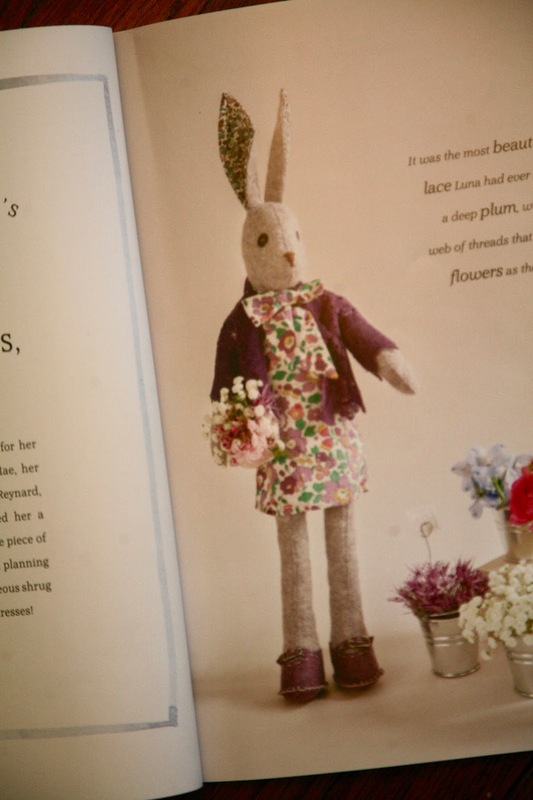 This is a British book, with full size patterns for the bunny and her extensive wardrobe (and brother's wardrobe), included. 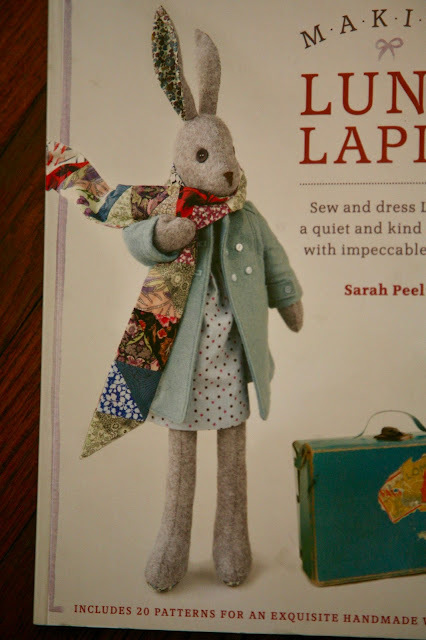 Luna Lapin seems to have a bit of a following in the UK, based on my google search results, although I had never heard of her until I saw the book. Maggie was immediately captured by this book, which provides a sweet narrative for Luna as well as lots of pretty pictures of Luna in her many dresses and adorable accessories and immediately started planning for her own Luna. She selected a snowy white wool felt for Luna's body, and we selected a pretty Liberty print for Luna's ears and the pads of her feet. Maggie preferred the look of small safety eyes to the buttons used for Luna's eyes in the book, and I found a soft browny-pink for her nose. Luna is partially sewn by machine, and partially by hand, using regular polyester sewing thread. She has moveable arms, with buttons used as joints, and a separate bottom piece that allows her to sit well. It took me a couple nights to finish her body, with Maggie acting as a tireless and relentless taskmaster. Then it was time to work on her wardrobe! 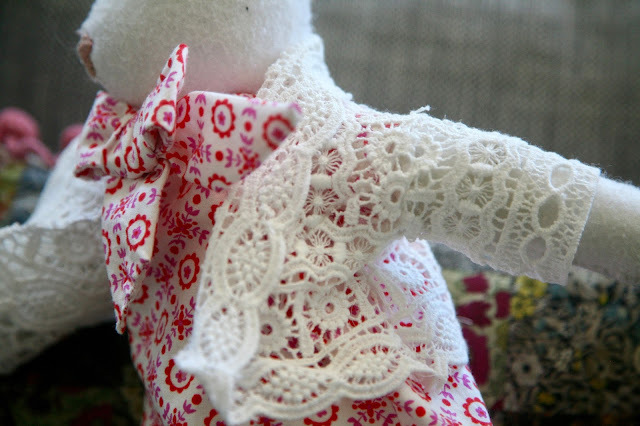 Luna's first outfit is a simple shift dress with neck bow, with mary janes and a lace shrug. She has cute knickers underneath. 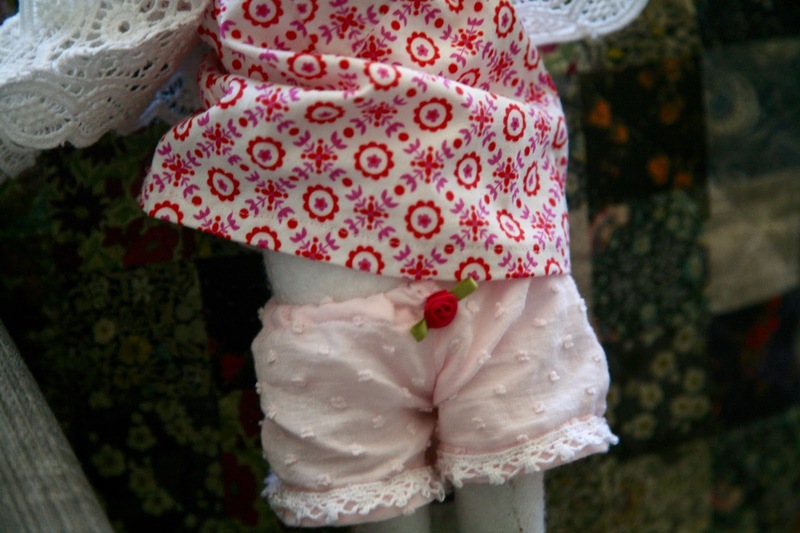 We chose a cute Cotton & Steel Lucky Strikes print for the dress and swiss dot for the undies. 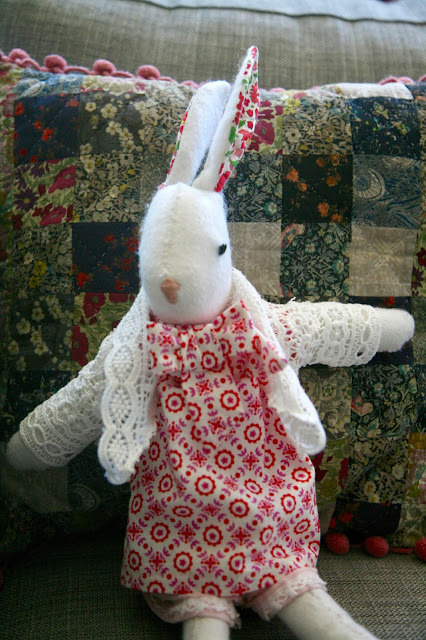 Maggie and I made a special trip to Stonemountain & Daughter to source bunny supplies, including lace for the shrug, tiny bunny buttons and snaps for the back of the dress, and lace to trim the knickers. Maggie charmed everyone in the store with her cute self and her bunny! So I know that the sewing blogosphere is alive with adult underwear sewing, but I'm here to tell you that sewing bunny knickers is THE MOST FUN THING EVER. Seriously. Maggie was especially delighted with the little rose, which I found in my prodigious stash. Note for next time: Cut a slit for the bunny tail. The book calls for a yard of scalloped lace to make the shrug, but it would be a terrible waste, since the pattern only uses the edge. Instead, we were able to make the shrug from 3/4 yard of a 5" wide, scalloped on both sides, lace trim. 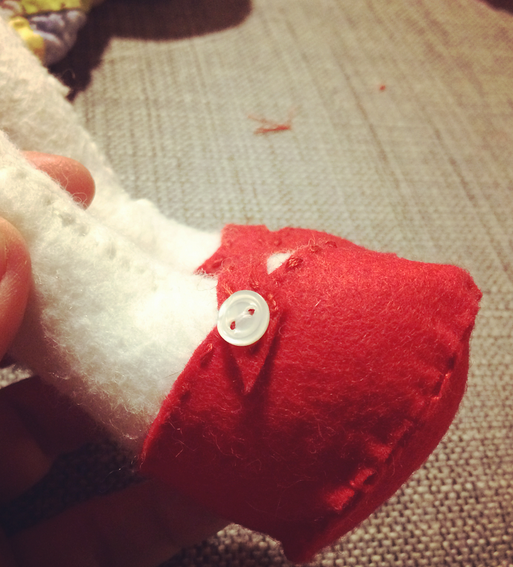 The pattern for this was pleasingly origami-like and fun to sew! I used a narrow zig zag to sew the lace seams, and based on how hard it was to seamrip one seam I did by mistake, I'm going to to say that it's very sturdy! Aren't the shoes adorable? They call for little miniature buckles, but I used small buttons instead. Ridiculously cute. I am happy to say that Luna is a well-loved member of the clan. She is a happy bunny, as far as I can see! Oh, this is the sweetest. The sort of thing I always wished my girls would love, but they never did. Then again, they aren't much for any sort of doll. But it's gorgeous. I think the shoes have got to be my favorite part. So adorable! Oh Inder! This is just the best! I have a similar book that I bought for Indigo for Christmas but we haven't made anything yet! You have impeccable taste and that little rose almost did me in! So precious! Your children have the most magical childhood! She is perfect! Those are the best knickers.